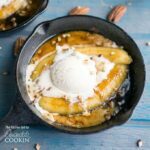 Grab your 5” skillet and deck out those bananas with caramel sauce and rum, topped with vanilla ice cream for Fat Tuesday heaven. Melt butter in skillet over medium heat; add brown sugar; heat until sugar dissolves, stir as needed (about 2 min). Stir in vanilla, pecans, and cinnamon (be careful: liquid/oil splattering may occur). Place bananas, sliced side up, in skillet; heat for about two minutes. Gently turn bananas over, sliced side down; continue heating for two more minutes. Remove skillet from heat; (optional) add and "ignite" the rum. To "ignite" rum (CAUTION: Igniting rum means to create an “open flame” in the skillet to burn off the alcohol. Please take ALL precautions necessary to prevent injury and fire, such as adult supervision and fire extinguisher on hand). Remove skillet from heat; pour rum over sauce; using a long match or long lighter, carefully ignite contents of the skillet; be sure to stand back as the flame may shoot out from the pan; once ignited, allow flame to burn and completely die before serving. Top caramelized bananas and sauce with 1 scoop ice cream; garnish with chopped pecans; serve warm. This recipe for Single Serve Bananas Foster was printed from AmandasCookin.com - https://amandascookin.com/single-serve-bananas-foster/ and can only be printed for education or personal use.